Writer-producer (and friend) Samantha Herman releases her new movie to iTunes today. She shares writing and producing credit with her brother Jesse, but I could hear her voice through the entire thing as I laughed aloud. On top of that, it has 3 people I consider friends appearing in it as well, Kristian Bruun, who gets to be a well-dressed, but slimey baddie, Pat Mastroianni, as a local radio announcer, and Matt Murray, as a bar tender at a local watering hole. So I may be kind of biased going into this one, but I can honestly admit to enjoying the film, and laughing out loud on more than a dozen occasions. 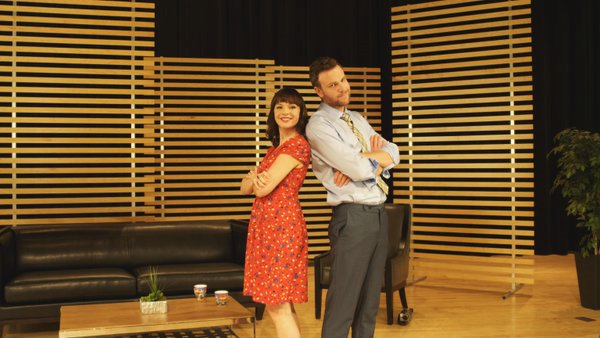 Let’s Rap follows a brother and sister, Bo (Brendan Gall) and Melanie Schnurr (Rachel Wilson), who are funny, inspired, and smart, but neither of them can seem to get their lives together, on any level. After an angry outburst at work, Melanie is given a mandatory vacation, and returns home to Toronto, where the entertaining and wonderfully crafted sibling banter laced with pop cultures, takes center stage. Not only do we notice how funny they are together (and the dialogue is really funny), so does their friend Ethan (Randal Edwards), who is looking for the perfect tv pitch, and is under a deadline to come up with something quick, as is his main competition, the conniving Stefano Chyka (Bruun). He sees the potential for a great chat show with the siblings, and perhaps finally have a chance with his crush, Melanie before it’s all over. But, as they do, things go awry, and we can only hope things will play out well for the sibling duo, that Stefano will get his just desserts, and that maybe Melanie and Ethan can sort out the problems confronting them, and have a happy ending. There wasn’t anything I didn’t like (ok, maybe a little bit more for Pat to do, but beyond that, awesome) in this film, it was so much fun, I couldn’t believe I laughed as loudly and as often as I did. I wanted it to be good, because, well, Sam, Pat, Kristian and Matt, but I genuinely enjoyed this one, and loved all the posters providing in-jokes in the back ground. Without sounding like I’m patting my friends on the back, everything in this film just works. The pacing, the style, the actors (the dialogue comes so naturally in this film, you’d swear it was improve or ad-libbed). Now, true, with the amount of profanity thrown around, and there is a wonderfully healthy dose of it, this one won’t be for everyone, but, as I watched it, maybe it was just the right thing, right time, I enjoyed the hell out of it. It also makes me wish Sam was here so we could hang out and laugh some more… but no, she has to be in sunny California. Laughs fill the profanity-filled heart of the film, and it’s a sheer delight, an exercise in belly-laughs and sibling love. Check it out on iTunes today!